My god, ten years since I updated this. I was going to take it down but it is the top site listed when "uncleaned coins" is googled and I'm a sucker for fame. Rasiel of "Dirty Old Coins" comes in second, which amazes me since he is still very active and I'm not. Speaking of Ras he has a new book out, a condensed (in size, not content) version of his Encyclopedia of Roman Imperial Coins he has named Aorta for some bizarre reason. Name not withstanding it is the book I recommend to our teachers when they ask ACE for advice. Recommended, the only book I know which contains a picture of every reverse of every Emperor in the entire Roman series. What is ACE you ask? I'm still active in ancient coins through the organization Ancient Coins for Education. We supply coins to teachers who are teaching kids ancient languages or history. I visit a few schools each year and I'm the Disbursement Officer who mails out a few thousand Late Roman Bronze a year. I still collect some although college costs has slowed that considerably. My interest also migrated a bit to artifacts and have a fairly decent collection which I take into schools as well. Whether coins or artifacts, there is something special about holding something thousands of years old which was held by someone else back then. A link through the ages to our shared humanity. Not all kids "get it", but it is wonderful to see the eyes of the kids who do. Maybe I'll get the artifacts up on the web someday. 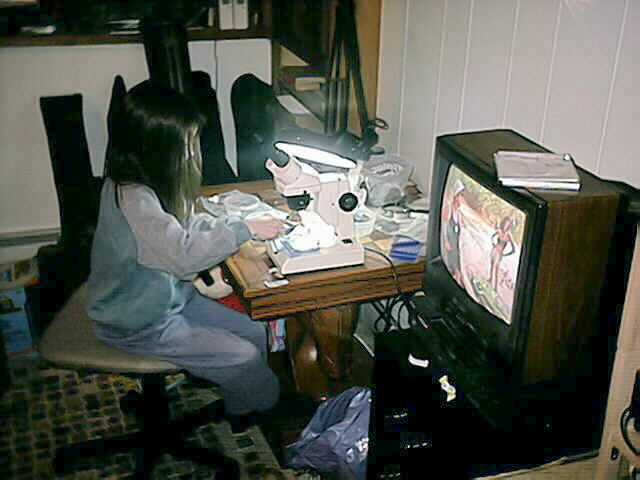 In the meantime to show how times go by, the little girl scrubbing coins while watching season one of Survivor under the "Joviel's Den" link at left is now a Senior in college. Here's a pic of her holding a neolithic axe mounted in a modern handle. The cabinet behind her holds the collection, it sits in the same spot in the basement where Sandy was scrubbing coins twelve years ago. So take my advice, step away from the computer and go hug your kids if you have them, you won't have them for long. Anyway, it is still a great hobby and I hope all of you get as much enjoyment out of it as I have. And if you reached this page directly without gong through the www.joviel.com home check out my other site, Tabloid Numismatics where I post hopefully humorous stories from ancient history illustrated with coins from my collection. The scanned images stink, maybe updating this page will give me the interest to update those pages with better photography. Enjoy! The 2nd Annual Coin Cleaning Contest is over and the results are available here! Congratulations to the winners, who now get to choose their prizes in order of placement. The Ancient Coin Cleaning Contest is now open!!!. Due to start May 1, 2002, participants will buy a group of uncleaned coins and two months later be judged on their efforts. BUT. You have to be a member of either the Yahoo UncleanedCoin group or the Yahoo UncleanedAncientCoin group to participate. So join, already!! The worst you can do out of this is receive some nice coins for your money. The rules and contest joining info are --> here. If your experience with a vendor differs from mine, please let me know. I would like to post the experiences of others too. If it appears that I am getting 'salted', unrepresentative lots we can run an anonymous test. I'll pay you for a lot which you send to me unopened. Let's keep 'em honest and find out who really has the best coins! BTW, from the feedback I've received so far (and thank you all for it,) my results are similar to what others are getting. I started using the percentage of coins attributed as a measurement. That has become unfair since that depends on my skill and interests. So, I'm instituting the "keeper", the official unit of measurement of ancient coins cleaned by semi-skilled amateurs. Byzantines, Greek, Roman Provincials and Islamics all count as keepers if I feel a knowledgeable source could ID them. I don't do this hoping for an increase in my investment - I don't encourage anyone else to either. But the value of the coins in a lot is the best estimation of the quality of the coins. I have therefore added my estimation of what the lot would bring on eBay if resold. I started with Sear's valuations and checked them against eBay and windwinds.com.